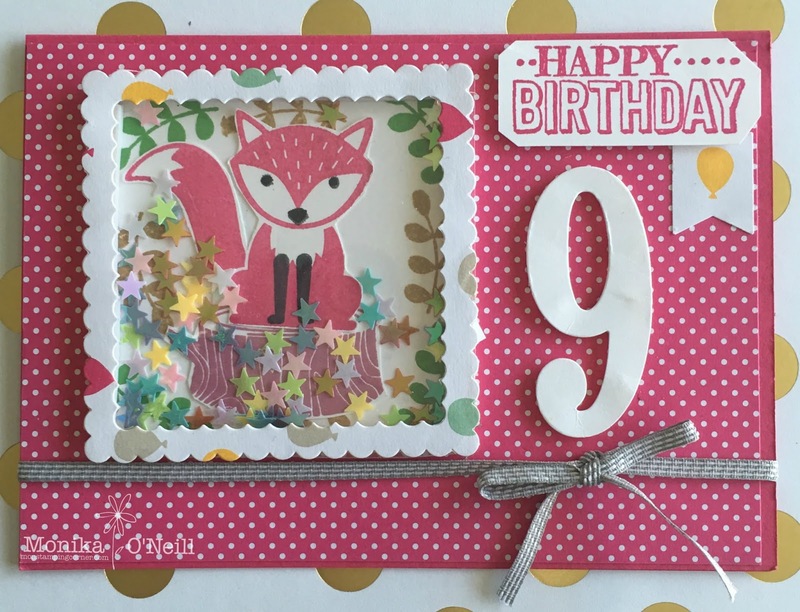 Hi everyone, todays card I made for my niece's 9th birthday. 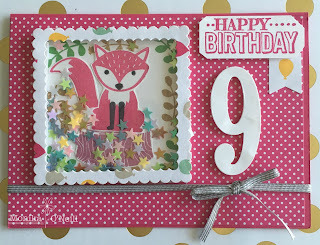 I used the Foxy Friends stamp set and made a simple shaker card, kids love shaker cards keeps them amused for a while. Cardstock is Melon Mambo and the pink polka dot paper is from The Pop of Pink DSP. I stamped the fox using Melon Mambo and fussy cut her out, I used chocolate chip for her legs and eyes, the log I used Chocolate Chip and also fussy cut, on the background behind the fox I stamped the leaves from this stamp set around the edges using crumb cake and olive green then added coloured stars which is what I had in my stash. For the shaker I used the new Layering Square Framelits, the largest and second largest scalloped edge then using the Large plain Framelit for the window sheet you just have to roll that through the big shot a couple of times, I used foam adhesive strips, they are so easy to use and make it very quick and simple. Large Number Framelits to cut out the 9 out of Whisper White, to finish off I wrapped some Smokey Slate Stitched ribbon. If you would like written instructions let me know and I will be happy to email them to you. Thanks for stopping by, hope you enjoyed todays card and see you soon. I have listed the products below to make it easy to purchase any of the items you might need to make this card just click on any item and it will take you to my shop.